Shopping for View-Master Educational Toys? Take virtual reality game play to a new level with View-Master Into the Labyrinth Game Pack, an innovative, mind-bending VR game! In this two-player game, you must work together to solve puzzles, collect all the gems, and escape the labyrinth. The Traveler is trapped in a peculiar place, a virtual reality labyrinth, while the Guide has a book of fun puzzle-solving tools. By working together and communicating with each other, they complete puzzles with the objective of escaping the labyrinth. The Traveler uses a View-Master VR Viewer (or compatible Google Cardboard viewer, sold separately) and describes what he sees and where they are moving. The Guide uses tools that offer assistance, like a book containing different configurations of the map, a journal with puzzle-solving instructions, a red and blue reader, a puzzle wheel, and a wet-erase marker that's perfect for notes. 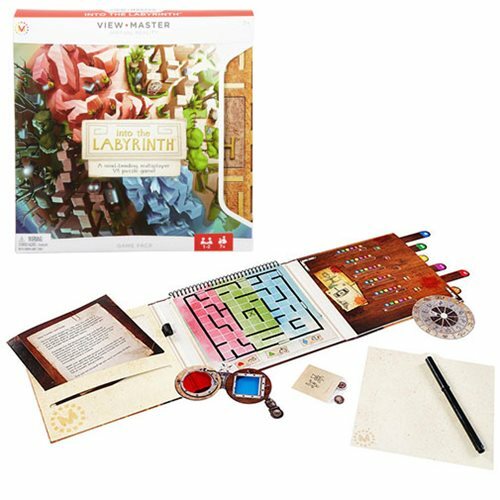 Transport yourself to another world with this View-Master Into the Labyrinth Game Pack. You'll experience 360-degree environments so it seems as though you're actually there, for a whole new level of realism. Seamlessly compatible with the View-Master system, this View-Master Into the Labyrinth Game Pack works with your smartphone to produce a stunning virtual reality experience.